From the ‘Birkin’ to the ‘Del Rey’ the ubiquitous signifier of femininity that is the handbag has taken on the mantel of an iconic consumerist object far removed from its original useful intention. With this in mind Transition Gallery in collaboration with Huntergather have commissioned six artists to explore images of female adornment using found handbags as their canvas. 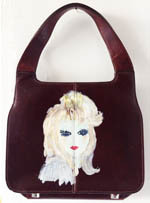 The artists are not, however, designing luxury items; their reclaimed bags are merely used as the ground on which to paint preoccupations inherent in their own work, employing a mildly subversive and doubling enactment, which nevertheless takes on board an understanding of the status of the object. Alongside the painted bags Paul Kindersley's performative makeup demonstrations unearth and obscure classic beauties from the past. In many of Angela Carter’s stories, jewels (which appear on many of the Ornament bags) play a fetishistic role, where they are the tools of seduction of a predatory male, which the author sees as a negation of femininity to which women themselves are attracted. Ornament explores, contradicts and delights in this female fascination. 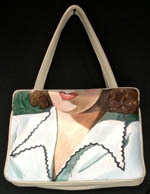 Kirsty Buchanan's painted bag looks at someone looking at him or herself. noir bags depict the necklines of iconic femme fatales. Alex Michon uses broken glass to stand in for diamonds in her depictions of the over arching femininity of drag queens. Alli Sharma inspired by Angela Carter's Wise Children paints perfume bottles. Corinna Spencer examines love and obsession with a series of painted gems. During Ornament the Huntergather store will also feature additional artworks by the artists, a unique jewellery collection by Julia Cook including collaborative works made with Katherine Tulloh and the Transition shop with its collection of independent publications and limited edition prints.